David Clarke Fullam died peacefully on April 4 after a period of declining health. He was 79. The son of Agatha (Rooney) Fullam and Paul Fullam, David grew up on the family farm in Sidney. Following the untimely death of his father when David was 13, he attended the Oak Grove Coburn School where his mother taught, received his BA from Colby and later received two Master’s Degrees from the University of New Hampshire. 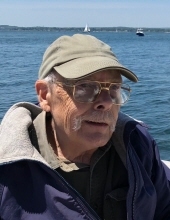 He leaves behind a daughter, Katie Fullam Harris and her husband Chip; a brother Con Fullam and his wife Maura; and a sister Mary Ellen Fullam and her partner Gus. He also leaves an extended family who adored him, including Gale Johnsen, Charlotte Fullam, Kathy Chaiklin and Rob Heard and Louise Giovanella and Paul Sokol. He was predeceased by his parents, Professor Paul Fullam and Agatha Fullam, and “Allie” and “Pops” Giovanella who loved him like a son. David was a complex man. On good days, he had a twinkle in his eye and a wicked wit. Equal parts academic, teacher and farmer, David recently noted that his greatest accomplishments in life included his career teaching sociology at the University of Southern Maine and chopping and stacking eight cords of firewood to heat the house every year. Though not an emotionally demonstrative man, David was clearly delighted when a former student recently spotted him at a restaurant and came over to thank him for the positive influence that he had on her life. David communicated his love for family and friends through building projects. As a professor, his salary did not readily support Katie’s obsession with competitive equestrian events. While most parents might have encouraged the pursuit of a less expensive passion, David used his ingenuity to build a perfect one-horse trailer for Katie’s pony, finishing just hours before they had to leave to compete at the Acton Fair horseshow. David’s favorite place on Earth was his farm in Porter. He loved nothing better than doing projects (often not to completion) and participating in activities involving physical labor. He adored tractors and farm machinery, and he joyfully participated in haying until recently. Just last summer, he and Chip had a terrific time trying to move a giant piece of granite with the beloved John Deere. Though the granite got the best of them, David’s grin shone brightly as he revved the tractor, spraying mud all over the yard and leaving a sizeable hole to be patched. David remained mentally acute and engaged in world news and politics until the very end. He read voraciously, and took particular delight in finding stories that recounted bizarre or amusing events or statements. Given the recent political environment, there were plenty from which to choose, and he would recount them with great delight and a rare grin. David rarely ventured far from Porter, but when he did, his second love was the sea. David was particularly fond of visits to Pemaquid Point with Gale, and he often mentioned that the sleeping porch that he built on his farmhouse in Porter was modeled after their favorite spot in Pemaquid. Though David’s life was one of self-designed solitude, he will be missed by many. We all hope that he has found peace, comfort and a big tractor and hayfield wherever he may be. The family would like to thank the incredible staff at Maine Medical Center, at Falmouth by the Sea and at Gosnell House for the care and compassion that they provided during David’s recent illness. To send flowers or a remembrance gift to the family of David Clarke Fullam, please visit our Tribute Store. "Email Address" would like to share the life celebration of David Clarke Fullam. Click on the "link" to go to share a favorite memory or leave a condolence message for the family.